Cardiff capped a stirring comeback to beat Portsmouth 3-2 courtesy of Craig Conway's injury-time winner to turn up the heat on their promotion rivals. The third-placed Bluebirds trailed 2-1 as strikes by Marko Futacs, helped by a blunder from David Marshall, and Greg Halford overturned Kenny Miller's 15th minute opener. But Cardiff refused to give up and second half goals from Mark Hudson and Conway's fourth of the season closed the gap on second-placed Southampton who face Leicester City on Monday night. Mackay said: "It was a well-deserved victory. The first 35 minutes was some of the best stuff we've played for a while. "We created chances, had three one-on-ones, scored a fantastic goal and, although Marshy made the error, there was a calmness going into the second half. 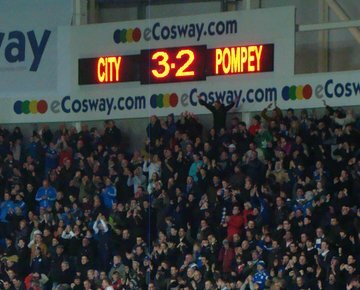 "Portsmouth are a big, physical team and we knew they would cause us problems from set-pieces. "We won the first header, but the ball broke lovely to their player and we found ourselves 2-1 down 10 minutes into the second half. But we survived that period. "We kept believing and playing and I was absolutely delighted with the mentality of the players. "We showed great mental toughness and character. We played well and I felt the goals would come. "We were bright and alive. Craig set up one and scored another but both came from set-pieces which we took quickly. We worked hard for things today." Miller put Cardiff ahead with a fine half-volley from an acute angle for his 10th goal of the season. But the home side were punished for a failure to turn their clear first half dominance into more goals. Miller twice, Joe Mason and Darcy Blake were all wasteful in front of goal and Cardiff were made to pay as Portsmouth equalised after 39 minutes. Erik Huseklepp's cross looked to be collected in routine fashion by Marshall, but the Scotland stopper dropped a clanger to hand Futacs a tap-in from eight yards. Portsmouth went ahead through Halford's close-range finish after Joe Mason's poor clearance from a Liam Lawrence corner. But the Bluebirds equalised when Hudson powered his header past Stephen Henderson from Conway's cross before the Scotland winger bagged his fourth goal of the season to claim a vital victory. Portsmouth boss Michael Appleton said: "It's not nice to lose in the 93rd minute but I'm more frustrated and disappointed by the fact we switched off from a quick throw-in and free-kick for the second and third goals. "We have a saying which we tell the players all the time that when the ball goes dead, we come alive. But that didn't happen today. "In saying that, I can't complain with the result. It is no fluke where Cardiff are in the league or the fact they are in the semi-finals of the Carling Cup."